So, I went looking for a gratin recipe to try. It seemed that most of the recipes I came across fell into one of two camps – either based on Ina Garten’s recipe and essentially a mac’n’cheese with cauliflower or based on Thomas Keller’s recipe as given in his book, Bouchon. I’m not a fan of mac’n’cheese, nor of alfredo or bechamel. The only time I make bechamel is when I’m making stuffed, baked pasta and even then, I mix it with a red sauce. Plus, I just didn’t want that much butter. Keller’s recipe, though more involved, was much more appealing. When I made it, however, it didn’t seem very involved. It may have a lot of steps, but they’re all pretty easy. So don’t let the length of the recipe fool you, okay? I had to make some substitutions, which isn’t surprising, and I altered some of the quantities to suit what I had. It came out wonderfully all the same. I’m really happy I decided on this one because it turned out so deliciously good. I’m really looking forward to doing it again when I have some horseradish on-hand because it’d be even better. Remove the leaves from the base of the stem and cut out the core. Chop the florets into bite-size pieces and remove the stems, placing them in a small bowl. Cut away the tough exterior of the core as necessary, then chop it into chunks and combine with the stems. Process the stem and core pieces in a food processor until finely minced (but not pureed!). You should have between 1 and 2 cups, if not, chop up some florets. Bring a pot of water to a boil, add salt and vinegar4. Blanch the florets for 2 minutes, then strain and place in an 8×8 casserole dish. Sprinkle with salt to taste. In the pot or a large saucepan, melt butter until foamy. Add onions and garlic, cook until translucent. Season with salt, pepper, thyme, parsley, curry powder and chili flakes (if using horseradish, don’t add it). Add the minced cauliflower core bits and water, then simmer for 5 to 6 minutes. Most of the water should evaporate and the cauliflower will be tender. Stir in the half-n-half and simmer for another 2 minutes. Remove from the heat and allow to cool for a few minutes. If using horseradish, add it now. Pour the mixture into a blender and puree until smooth. Taste and add salt if necessary. Pour the pureed sauce over the cauliflower florets evenly. It should come about halfway up the side of the dish. If you want, you can stop here and refrigerate this for up to an entire day. The flavors will blend together and it will be even better. Just don’t put the cold dish into a hot oven – let it come up to room temperature first. 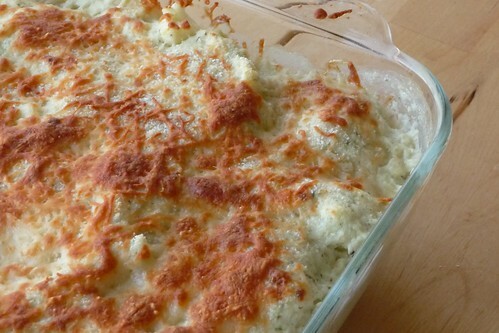 Sprinkle the gratin with bread crumbs and cheese. Bake for 15 minutes. Test the center (if you chilled it) with a metal skewer or a butter knife – if you touch the tip to your lip or tongue, it should feel hot. Finally, broil for 2 minutes to evenly brown the top. Serve. If you have fresh thyme and/or parsley, you should use that. Keller says to put in the sprigs whole, then remove it – it helps preserve the whiteness of the dish. Since I had only dried in the cupboard, I didn’t worry about it. Horseradish would have been soooooo good. But chile flakes worked too. He called for Comte or Emmenthaler, I used Italian blend from a bag. Boy, let’s hope he doesn’t find out! Could you imagine Keller ever using cheese in a bag? No, I didn’t think so. I don’t get paid the big bucks so it’s cheese in a bag for us. Did you know that adding vinegar helps preserve the color of the cauliflower? It also helps preserve the structure of boiling potatoes – a great thing if you’re intending to fry them up later. Science is neat! This entry was posted in american, gluten-free, recipes, side, untranslated, vegetable, vegetarian. Bookmark the permalink.